Depart from Upington – Ai-Ais/Richtersveld Transfrontier Park Depart 830 and enter Namibia via Nakop border post, then on to Karasburg to Ai Ais / Richtersveld NP. Main points in this arid region include the Ai-Ais Hot springs and Fish river Canyon ( the 2nd largest canyon in the world. ) A wide variety of succulent plant species abounds here. Ai-Ais means, burning water and points to the hot springs, and you can visit this inside the camp One of these springs has its eye within the camp and we will enjoy the relaxing water at the spa. 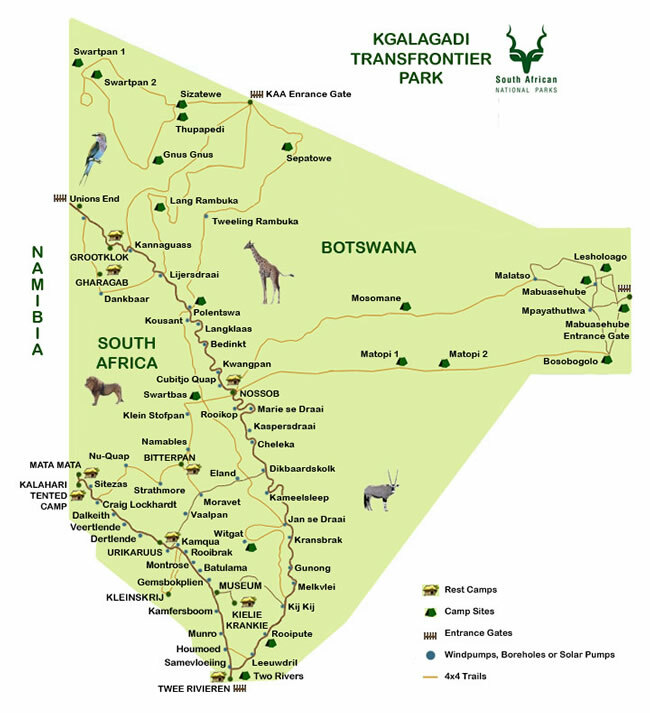 Ai-Ais/Richtersveld TP – Gondwana Park We depart to the Fish River Canyon by driving through Gondwana Park. The canyon is 165 km in length, 27 km wide with a depth of 550 m. We visit different viewpoints overlooking the canyon. Game present is springbok, gemsbok, red hartebeest, Hartman’s zebra, kudu, klipspringer and ostrich. Ai-Ais/Richtersveld – Luderitz Early departure to Luderitz and we visit Naute dam – which is the home to a wide variety of water birds. Next is Luderitz on the B4 through the Namib Desert. Visit Diaz cross and the Halifax island – home to Cape fur seals and flamingos. Luderitz – Aus Today we enter Diamond Ghost Town Kolmanskop for a guided tour of the town. After this visit we drive back inland on the B4 to Aus. We stop at Garub to see the Wild desert horses of Aus. Aus – Sesriem We depart north to Sesriem by driving through the Tiras Mountain reserve as well as the Namib Rant nature reserve. Sectacular views of the Namibe desert awaits us. Solitaire – Cape Cross Today we drive to Swakopmund and the road enters theNamib Naukluft Park again and pass through the dry Kuiseb River Valley – one of the most dry areas in Namibia. From the Kuiseb Valley to Namibia’s main harbour, Walvis Bay, the road crosses the gravel plains of the Namib Desert and gemsbok, springbok, ostrich and Hartmanns mountain zebra can be seen in this massive desert. We stop at Walvis Baai lagoon where numerious flamingos and water birds are present. We drive on to Namibia’s biggest holiday town, Swakopmund and along the Skeleton Coast via the National West coast Recreational Area to the Cape Fur Seal colony at Cape Cross. We drive past the LICHEN FIELDS. Lichen consists of algae and fungi living together in symbiotic relationship. We visit he Seal colony, where we can see jackals and brown hyenas. Cape Cross – Twyfelfontein We drive North until the Skeleton Coast Park, where we exit at Springbok Gate and move on to a Wrld heritage site at Twyfelfontein. We visit theBushmen Rock paintings during a short guided tour. Twyfelfontein – Etosha National Park Depart to Outjo via Khorixas. We stop for a short guided tour of Petrified Forest on the route to Khorixas. Then on to Etosha, where we enter at Anderson gate in the south. Drive on to Okaukuejo Rest Camp. Etosha covers an area of 22 230 square km. Etosha Pan is 120 km long and 70 km at its wide. The big five species- elephant, black rhino, lion and leopard can be seen. Black-faced impala and Damara dik-dik, giraffe, red hartebeest, gemsbok, eland, kudu, cheetah, hyena and gig groups of wildebeest, springbok and zebra are common. We do an afternoon game drive, or you relax at the waterhole. Etosha National Park We do several game drives in the area. Etosha National Park We do several game drives, according to game reports and weather. Drive on the B8 to Popa Falls, which we visit, and we also visit Mahango Game reserve, known for its incredible bird life. Today we drivethroughthe Caprivi Game Park on the B8 to Kongola, then to Namushasha Lodge on the banks of the Kwando River. In the afternoon we visitthe Mudumu NP. You have the option to do a boat cruise on the Mudumu river. We drive via Katima Mulilo to the Ngoma Brige where we cross into Botswana after clearing customs. We drive through throughChobe National Park to Kasane. Chobe National Park is famous for its huge elephant numbers. This Park has the highest concentration of elephant anywhere in Africa (46 000)We will also see huge herds of buffalo and a rich bird life. Game drive to Sidudu gate. We game drive until midday in Chobe National Park, then return to Kasane. Optional afternoon boat trip on the Chobe River, cruising into the Park. We do a guided day-tour to Vic Falls. This tour goes through the Zambezi National Park to Vic Falls and back in the afternoon. TheVictoria Falls and Zambezi National Parks is a WORLD HERITAGE SITE and is one of the ‘Seven wonders of the world’ as well as one of the largest water falls on earth. The falls are 1,7 km wide and nearly 550 million litres of water drops 108 meters into the river below – every minute.Victoria Falls is made of five different falls. Four of these are in Zimbabwe: The Devil’s Cataract, Main Falls, Rainbow Falls and Horseshoe Falls – and one, The Eastern Cataract, is in the bordering country of Zambia. Zambezi National Park together with Victoria Falls National Park covers an area of 56,000 hectares. The northern border of the Park is formed by the great Zambezi River which also forms the border between Zimbabwe and Zambia for much of its length. A wide variety of larger mammals may be found within the Zambezi National Park including The Big Five: elephant, lion, buffalo, leopard and white rhinoceros. Also large herds of sable antelope, eland, zebra, giraffe, kudu, waterbuck and impala as well as many of the smaller species of game can be seen. Optional activities include bungi jumping and a helicopter flight over the falls. Drive on to Nata via theKasane, Kazuma, Sibuyo Forest reserves. We visit Nata Reserve/sanctuary. The Nata Sanctuary at Sowa Pan, which is part of the Makgadikgadi Pans, is a community project and one of Botswana’s premier birding destinations. Nata Sanctuary is home to 165 bird species including flamingos and pelicans. After good rains, hundreds of thousands of globally threatened Lesser Flamingos, along with Greater Flamingos, Chestnut-banded Plovers, Great White and Pink-backed Pelicans, and a host of other waterbirds converge on the nutrient-rich waters of the pans. As the pan dries out, the Sanctuary hosts the largest congregation of Lesser Flamingos in Southern Africa. Drive to Francistown. Today we drive to the South African border post at Groblers Bridge, through Francistown. Proceed to Marekele National Park. This Park lies in the heart of the Waterberg Mountains, the cut-off zone between the dry western and moister eastern regions of South Africa. Majestic mountain landscapes, hills and deep valleys characterize the park. Yellowwood and cedar trees, five meter high cycads and tree ferns, are some of the plant species found here. large game species from elephant and rhino to lion, leopard, cheetah, brown and spotted hyena, antelope species such as reedbuck, mountain reedbuck, eland and tsessebe as well as an amazing variety of birds including what’s probably the largest colony of endangered Cape vultures (more than 800 breeding pairs) in the world, is permanent residents. Short game drive, then we depart to Johannesburg where the tour ends. Included: drier/guide, vehicle, fuel, meals, accommodation costs, cross-border fees. Excluded: conservation fees, optional activities.